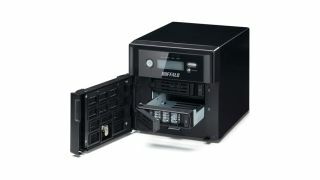 Buffalo has announced the launch of its latest Windows Storage Server solution, the TeraStation WSS 2012. Aimed at 'small and midsized businesses' (SMBs), the company is pitching the device as an easy to use, high performance solution that can be integrated into networks and 'bring your own device' (BYOD) setups. The series is available as either a rackmount or desktop setup and has a variety of storage capacities, from 4TB to 24TB. Under the hood the TeraStation is equipped with one of two Intel Atom Dual-Core processors - either the D2550 or D2700 - depending on the model. Buffalo's offering, once deployed, allows networks to automatically access and manage storage in a similar fashion to Windows Server. PowerShell and Microsoft Systems Centre are compatible with the TeraStation. Supported by RAID, the TeraStation also features backup functions as well as hot swap ability, enabling users to change disks without server downtime. The TeraStation WSS 2012 R2 is available now from £584 ($951, AU$1061).